Santino Ferrucci knows the history. He has heard the whispers. He doesn’t deny it. But rookie Ferrucci also realizes the INDYCAR Grand Prix and 103rd Indianapolis 500 presented by Gainbridge provide him with an ideal way to put the end of his 2018 European racing season behind him and cut a new path in his young career in the NTT IndyCar Series. Ferrucci, 20, from Woodbury, Connecticut, raced in European-based ladder series, with an eye on reaching Formula One, since 2014. He climbed to Formula 2 – one rung below F1 – midway throught the 2017 season and started last season with Trident Racing in F2, while also serving as a test and reserve driver for the Haas F1 Team. But Ferrucci and Trident parted company after Ferrucci was banned for two race weekends after colliding with his teammate on the cooldown lap after the F2 race in July at Silverstone. Sponsorship issues also compounded the fracture in the relationship. Ferrucci returned to America and found a seat in the NTT IndyCar Series with Dale Coyne Racing at the last two events of the season, in September at Portland and Sonoma. “It’s still there; it’s always going to be there,” Ferrucci said of preconceived notions about him after the incident last July. “It’s something that’s very hard to walk away from, especially in today’s media. A lot of people still don’t know who I am but still have a lot of opinions on me. Ferrucci also raced with the Coyne team in the double-header last June at Detroit in his series debut, immediately after the Indianapolis 500. He served as a replacement for good friend Pietro Fittipaldi, who suffered a broken leg in a crash during a World Endurance Championship sports car event in early May at Spa-Francorchamps, Belgium. After finishing 20th or lower at both races in Detroit and in Portland, Ferrucci improved to a steady 11th to close the season at Sonoma. That impressive result helped to put the Silverstone incident behind him and started a new career path and identity. “We ran very well in Sonoma and Portland,” Ferrucci said. “In Portland, unfortunately we had a few issues with a fuel sensor and would have had a very nice result other than running out of fuel. But racing’s racing. Progress continued at the 2019 season-opening Firestone Grand Prix of St. Petersburg earlier this month. Ferrucci finished a career-best ninth after starting 23rd in the No. 19 David Yurman Honda fielded by Coyne. Ferrucci will race full time this season in the NTT IndyCar Series as Bourdais’ teammate at Coyne. He looks forward to learning more from four-time Champ Car series champion Bourdais and to finding a new home and long career in the IndyCar paddock, erasing any previous baggage. Ferrucci is driving toward his first Month of May with a mix of anticipation and nerves. 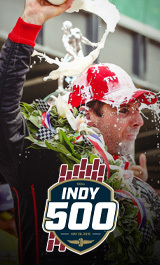 He knows he will feel right at home during the INDYCAR Grand Prix on Saturday, May 11 on the IMS road course. But the 103rd Indianapolis 500 presented by Gainbridge on Sunday, May 26 is another story. His INDYCAR oval orientation test last October at Texas Motor Speedway was his first career experience of just left turns. The affable Ferrucci knows he has plenty to learn. He also knows the eyes of veteran drivers will be on him based on his inexperience and any artifacts remaining from the Silverstone incident last year. “Is it too soon to say I’m looking forward to the golf?” Ferrucci said with a laugh when asked about his anticipation for the Month of May. “All jokes aside, I’m pretty nervous. It’s a different animal, to say the least. “And for the Indy 500 to be my first oval race? You take everything that Seb tells you to heart. You listen to everything he says. You don’t want to put a foot wrong because you want to earn the trust of the veterans. If they don’t want to race with you, you’re out, more or less. You’re pushed to the back.